Many Peter Pan fans been asking for a very long time, "When will Peter Pan be released from the Vault?" Their wait was finally over when, on February 5, 2013 the the sixtieth anniversary of the original release of Peter Pan, Disney released Peter Pan from the Vault again. 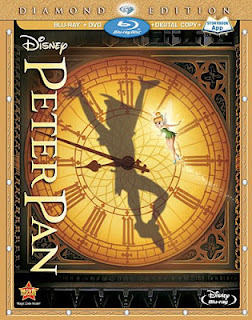 Disney released three versions of Peter Pan, including the Diamond Edition blu-ray DVD combination with two discs in DVD or blu-ray packaging and a Diamond Edition with three discs that also includes a digital copy of the movie and a storybook application. I love that Disney created new cover artwork from the illustrations of Mary Blair for this release. 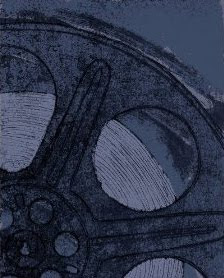 Mary Blair was an artist who created concept art for Peter Pan and for other Disney movies that included Alice in Wonderland, Song of theSouth and Cinderella. I think this cover is absolutely stunning, particularly in the gold colored three-disc Diamond Edition version shown here. If it wasn’t so ridiculous, one might actually want to own two copies of the movie just to have both versions of the artwork. As a matter of fact, I think this artwork is nice enough to grace the walls of a child’s bedroom or even my family room, but I digress! Of course, the re-release of Peter Pan means that the movie has been digitally restored and the sound upgraded. As always with Disney’s re-released movies, it includes a long list of more than FOUR HOURS of bonus features that includes a new song and previously deleted scenes. Blu-ray.com calls this latest release of Peter Pan, "even more wondrous and magnificent" than the original. They say that the sound is strong and that the video is stunning although fans will note that it is slightly different than the original. High-Def Digest says that Disney has done another marvelous job, that it looks and sounds fantastic and says, of course, that Disney fans MUST own it but that for others it is most definitely HIGHLY RECOMMENDED. I cannot wait to see Peter Pan again. How about you? Or maybe you already have! If so, be sure to leave us a note a nd let us know what you thought. Order your copy of Peter Pan (2013) from Amazon. Learn more about Disney's Vault.